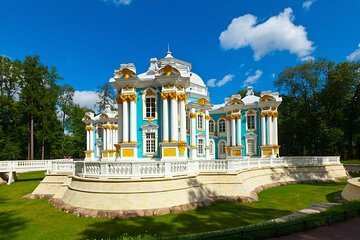 Spend a half-day beyond the boundaries of St Petersburg with a private guided visit to Tsarskoye Selo, a unique suburban village that's also the home of Catherine Palace. Enjoy ample time exploring local parks, marveling at the distinct architectural details of Alexander Palace and touring the halls of Catherine Palace—including its stunning Amber Room, a perfect recreation of the exquisite chamber lost during World War II. See monuments, bridges, pavilions and buildings in a variety of architectural styles.